Will this boot directly or will give boot options whether to go for Win Xp or SlpashOS after installation ? No, you will get choice to select from Windows Boot loader. I installed slap OS on win 7 ultimate,even it asked for WI-fi settings.But to my surprise I am unable to see it in boot manager to select and no where it is available,except my old windows versions and win 7,the installation is perfect. pl.help me what to do as i like this a lot. Try installing again, SplashTop installs and Boot options shows under Windows Loader. But rite now i have dual boot with XP and Win 7. 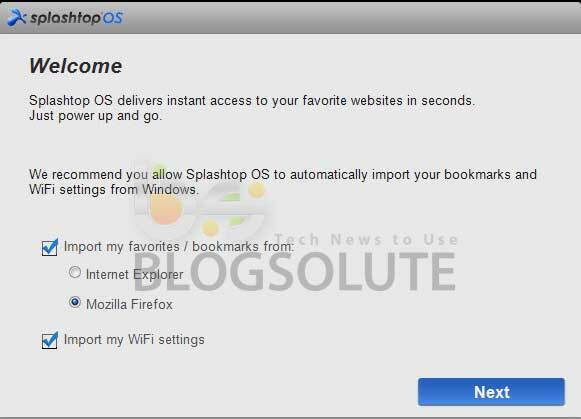 So if I install SplashOS .. i will have 3 OS to select from in the Boot Menu ? Also i have internet connection which is Dial Up Broadband.. does SplashOS allows us to installl dial up ? Even I have 3 Operating systems – Windows 7 , Ubuntu and Splashtop OS so that’s not a problem. By default, there are no such internet configuration settings inside OS but you can import Wi-Fi Settings from current running Windows OS. I guess, Dial configuration cannot be done and it supports selected Notebooks. I suggest not to install unless you have Wi-Fi facility.